This article appeared in the Winter 2007 issue of Texoma Living! magazine. “As long as I live you can always find me close to the Ole Red River. I was born here, raised here, my heart and soul are here, along the sand bars and swift waters, listening to the wind whispering through the willers,” said Dean Price, better known as Wildwood Dean. 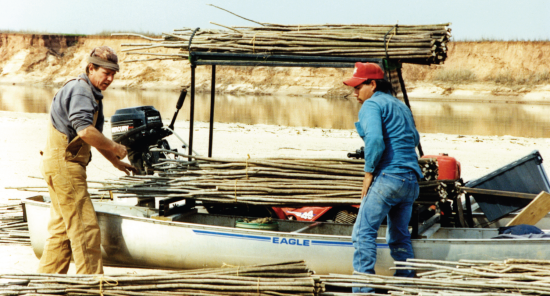 Born in Fannin County, north of Savoy, he has had a lifelong love affair with the Red River. Dean’s family moved to a farm in Mulberry Bottom on the river when he was a small boy. His father, Joe, was a commercial fisherman, and since money was scarce he made nearly everything he used. The older of two sons, Dean Price grew up following his father around the farm, learning from the older man how to build boats and net hoops, carving needles and blocks, and how to tie fish nets. “He also taught me about the trees and plants along the Red River, and that is how I learned to respect dogwood,” said Price. “My dad taught me a lot of his crafts, and the hoop nets were where I eventually got the idea for my furniture pattern. 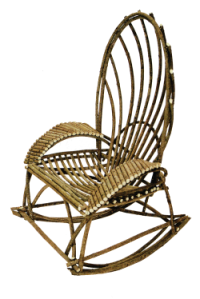 You can see the hoop in the design,” he said, as he pointed to a chair he had made. Some of his favorite memories include going with his dad on his excursions up the ‘Ole Red’ in search of suitable dogwood for hoop nets. They would pass many sand bars with acres of willow that Price thought would be perfect for net hoops, but his father told him “willow won’t last but one season submerged in the river.” He always held out for dogwood for his hoops because he could put it in the river season after season. Price spent his early years happily following his father around the river bottom, a quiet place that was home to foxes, possum, raccoons, rabbits, and squirrels. They also encountered many snakes and an occasional skunk while crawling through the dogwood thickets. Following graduation from Bonham High in 1959, Price moved to Dallas to work for Braniff Airlines, and he met and married his wife Della, but he never lost his love for the Red River. In 1969, he and his family returned to Fannin County. In the early ‘80s, the economy took a downturn, and so did Price’s janitorial service. The economic change brought Price back to the idea of making a living on the Red as his father had before him, and for four years, he kept working on the idea. He toyed with the thought of becoming a guide and considered several other options, but nothing quite worked out. The turning point came early in 1986 when he and Della went to visit her brother, David, and his wife, Frieda, in Brownsboro. The couple owned a store that featured country collectibles, primitives, and pioneer furnishings. Price came across a willow table that was for sale and declared that he could build a better one, one that would last longer, out of dogwood. “They challenged me to build some furniture and said that if I’d build some, they’d sell it,” recalled Price. “All the way home I thought about building furniture and I wondered if the wood that my dad made the net hoops out of was really dogwood. After I got home, I went to the river to gather some dogwood and then I built my first furniture. The handmade Shell-Back Rocker constructed of Red River dogwood. The process of building the furniture was not easy. The first thing Price had to do was collect the dogwood limbs. He would put his skiff in the water just above Telephone, and float down the muddy waters searching the coves and sloughs for the dogwood. Returning home with the wood, he would trim each piece, and the long process of bending each limb to his specifications began. “I’d take a five or six-foot piece of dogwood, step on one end of it, reach down and get the other end and pull it up, and put a long string around it. The wood would just have a gentle curve to it at that point and I’d let the dogwood cure for three or four days. I’d let the dogwood get used to its shape before I’d bend it any more,” he said. “Then I’d take that string and wind it down and tighten it up. I’d usually have to tighten it three or four times. I’d do that until I got the wood shaped like I wanted. I’d do that with each piece of the chair, or whatever piece of furniture I wanted to build, until they were the shape I needed, before I’d ever start building. Patience and time are the key words,” said Price. 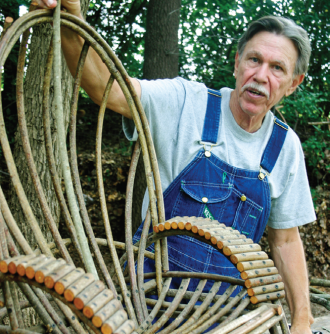 From a modest beginning in 1986, his unique furniture design made from dogwood twigs has gained nationwide recognition. The Dallas Arboretum and all 25 Neiman-Marcus stores, including those in Hawaii, London, and Paris have featured his timeless designs. Dogwood shelving he built for Susan Crane Inc. displayed Dallas products for sale in the former New York World Trade Center. Somewhere along the line, Price’s furniture became something more than furniture; it became art. That is why straight chairs now go for more than $1,000 for more extravagant prices. He has slowed down on his furniture building in the last few years, but he has kept busy researching, traveling, and writing about the “Ole Red.” He wrote his first book, Treasure River, following a 400-mile, 14-day trip down the river with his son, visiting with the people they met along the way and sharing their experiences of the river. When he had book signings at local bookstores, he took along a dogwood table and chair that he had built, to use as he signed his books. His second book, “River of Dreams,” is in the publisher’s hands and will soon be ready for sale. Price has won many awards, but two in particular stand out. In 1998, he was selected by the Texas Forestry Association as the recipient of the TFA Excellence in Wood Design. “This was a double honor in that my furniture designs were nominated by Roger Martinez as part of Neiman’s ongoing support of the arts,” he said. The Texas Cultural Society asked Price to present a paper at their Third Annual meeting in Midland. The Society chose 10 of the 16 papers presented for an audio cassette presentation, and Price’s “Survival Value in Fannin County—Then and Now” was one of the 10. I came across an article in the TEXAS PARKS & WILDLIFE magazine that a segment was about Mr. Price and his love for the Red River. I really enjoyed his description of his growing-up years and following his dream. I Googled his name and came up with this article. The furniture he makes is so beautiful. It makes me remember my family members who came before me and what they endured. My entire life has been spent in Weatherford, Texas not that far from the Red River. Thanks for sharing this amazing story. The Needlework Guild Association has a long tradition that dates back to its founding in 1885. The Sherman branch was organized in 1929 and hosts two event each year. Proceeds from the events help buy new clothing, linens and toiletries for persons in need. Money raised from this year’s tea goes to purchase more than 2,000 clothing items for hundreds of Sherman students.